Am I a bad mom if I'm not good at doing the tooth fairy thing? Camryn has been subject to a somewhat hit and miss tooth fairy experience. First, I don't let her put the tooth under her pillow because she's not a heavy sleeper so I just know when I or my husband goes in there we'll totally wake her up. Instead, we have her put the tooth in a little dish. The last time she lost a tooth, just a couple months ago, I had her put it on the shelf in the entryway so the tooth fairy could easily get in and out. Or so I told her. I also forget. Several times the tooth fairy has not come to collect our daughter's lost tooth the night of the losing of said tooth. Mark and I have had to come up with excuses as to why this happens. "The weather was terrible last night! She probably didn't do any tooth collecting at all." "You didn't lose your tooth early enough in the day to get on her schedule for that night." "There must've been a ton of kids losing their teeth this week so she's back-logged." But you know what Camryn did this last time? She decided to leave a note for the tooth fairy with her request of how much money she wanted (yes, really) , as well as a few questions for Ms. Fairy. So you know what I did? I answered the questions of course! There were 3 questions and I can't remember all 3 now, but I do remember that I answered them quite well. But my dear daughter recognized my writing. I suppose I could've been found out, but I waved her off, saying it was just printing and anyone can print like I do and it wasn't me anyway, it was the tooth fairy! She either believed me or decided to let it go. 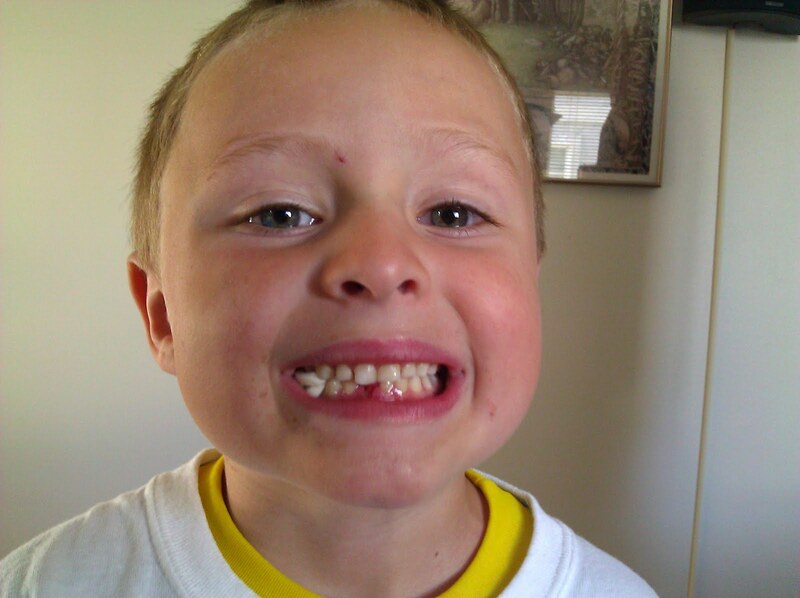 So today, my little boy lost his first tooth. And it begins again. I didn't know chewing gum could make a loose tooth come out. But it makes sense. Do you think I can be a better tooth fairy this time around? I just am dumbfounded that you could forget from the time Cami went to bed, to be the darn tooth fairy, and get the tooth out of that dish!! My whole childhood, I thought the Tooth Fairy was the coolest of winged creatures. So silent, swift, and apparently the weight of a millions quarters was nothing to this little nymph!! So, what's the fee these days? Ten bucks? Geez Mom. I guess I forget cuz once the kids are in bed I'm not MOM anymore. What don't you understand about kids chewing gum? The Tooth Fairy's banker has a thing for my daughter, so she's gotten BANK for each tooth. The banker always comes up with a great excuse to validate the extra cash. I also have some great friends that have provided me with official TF stationary. The tooth box the dentist gave us makes its way back a few days later with a note. Basically own it - sell the TF story even when caught. Oh and develope a handwriting specifically for Santa and the TF, either that or print it from the computer. Awesome, J! Thanks for linking up and of course, putting yourself out there!! I'm glad I had something worth linking up! If I had a nickle for every time I forgot I would have a lot of nickles. I have made the sneak move of putting it under the mattress in the morning telling them she must have been playing tricks - they also confuse her often, she is so easily confused.. So glad I'm not the only one!